Experience a variety of scenic adventures for all ages in and around Anchorage, from your home base at the 50th state’s favorite ski resort. How does someone who feels frozen as soon as the temperature drops below 55° wind up in Alaska for a vacation? After doing some research for one of FTF’s members and seeing photographs of its beauty, I decided to pack my fleece clothing and go. In August, my family visited the Anchorage area – a memorable experience, and, although drizzling on and off, not that cold after all. Our decision to stay at the Alyeska Resort was based on its location between Anchorage and Seward, but it turns out to have been an excellent choice for many other reasons. This chateau-style hotel, centerpiece of the winter Alyeska Ski Resort, is set in the spectacular wilderness of Glacier Valley, adjacent to the scenic Turnagain Arm of Cooke’s Inlet and surrounded by the rugged Chugash Mountains. Driving along the Seward Highway at water’s edge, we were not disappointed at Beluga Point, spotting several white whales cavorting in the cold water. 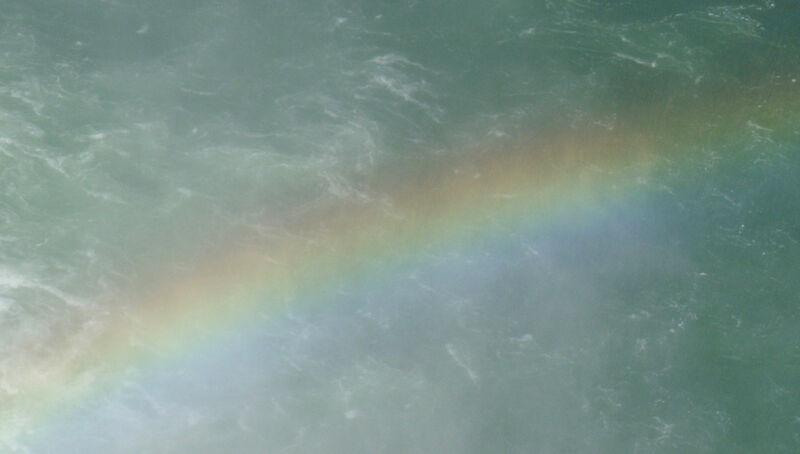 No luck seeing local Dall sheep or moose, but numerous beautiful rainbows filled the skies. Based just 40 miles south of Anchorage, we were near enough to explore Alaska’s largest city as well as relax and enjoy the Alyeska’s offerings. Surrounded by seven glaciers and lush green forest, all 304 guest rooms offer amazing mountain views and the location provides a sense of being “off the beaten path.” We soon understood why this is considered to be Alaska’s premier resort. The on-site Fitness Center features a pool, whirlpool with views, sauna, work-out facilities. The Spa at Alyeska offers a variety of massages and treatments including pre-natal, pregnancy and post-natal treaments, and yoga classes. Several restaurants and lounges present many dining options. In the summer, the hotel offers bike rentals, guided nature walks and glacier bowl hikes. 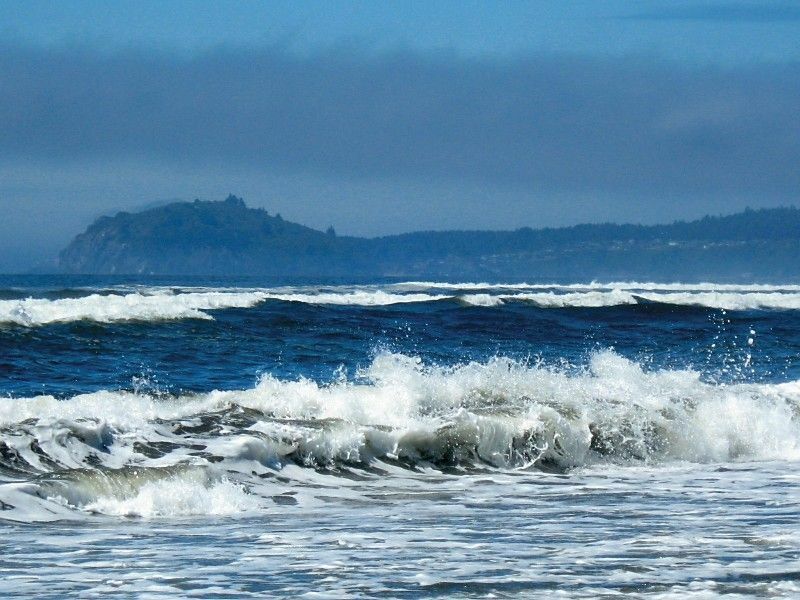 Additionally, the excellent staff will help you arrange for a wide variety of adventures, such as paragliding, river rafting, sea kayaking and horse back riding, or flightseeing, dog sledding, glacier hiking, northern lights viewing, fishing and local sightseeing, which can be done year-round. The Alyeska Resort’s glass enclosed 60-passenger aerial tramway attracts visitors from all over the region. It is open year round for those who enjoy the view from the top of Mount Alyeska, hike the numerous trails, and enjoy lunch at Bore Tide Deli in the Upper Terminal. I had my heart in my mouth as we watched several hang gliders jump off the cliffs from this height, especially after my 14-year-old son announced that he’d love to try it sometime! We learned that winter activities include Alpine and Nordic skiing for all levels, snowboarding, snowshoeing and ice skating, as well as winter-only adventures arranged through the concierge: heli- or snowcat-skiing, snow safaris and ice fishing. We agreed that this resort had been a great choice, the kind of place we would love to return to; too bad it’s 3,400 miles from home! In order to cover as much ground as possible, we chose one of the Kenai Fjords Tours which combined a journey on The Alaska Railroad between nearby Girdwood and Seward with a Kenai Fjords National Park Tour. This all-day excursion began by boarding the pristine navy blue and yellow train at 8am at the tiny “station” in Girdwood. 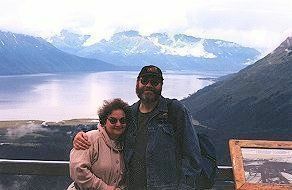 We traveled along Turnagain Arm and through magnificent wooded scenery in a comfortable dome car providing 360° views. A buffet breakfast was served during the narrated tour as on-board guides discussed the region and helped us observe wildlife and other points of interest. We arrived in Seward at around 11am and soon boarded the m/v Coastal Explorer, our comfortable sightseeing vessel with upper and lower viewing decks and a windowed inside seating area. While cruising through Resurrection Bay and among fjords, inlets and islands, we spent the afternoon running up and down and in and out of the cabin to the announcements of the tour’s narrator so we could take in all that we could. We made the acquaintance of a group of frolicking sea otters, floating on their backs. They dove down to catch shellfish, smashed them open on their tummies with rocks they stored in the flaps of their armpits, then shoved them into their mouths! We also observed puffins, eagles, sea lions, Humpback and Minke whales. What a great experience! However, I think the highlight of the day was arriving at Aialik Glacier where the Captain turned off the engine and we stood still, observing and listening to this great wall of ice. 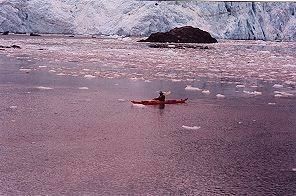 Just near the edge of the glacier we spotted a lone kayaker, gently paddling around the small icebergs and wondered where he came from and how he ever got there! It was a sight we will certainly remember. Upon arriving back in Seward, after being served lunch aboard the ship, we re-boarded the train for the trip back to Girdwood, arriving at 9pm. We were exhausted after this long journey, but so enthusiastic about our incredible day! With our limited time, we had to make some choices about what to see in the city. We spent a long and worthwhile visit at the Anchorage Museum of History and Art. It presents an extensive and fascinating historical exhibit covering the region’s indigenous people and early explorers through Alaska’s statehood and the Alaska Pipeline via artifacts, photographs and displays. Separate, but very much related, are the impressive explorers’ sketches, grand landscapes in oils and photography, and, my favorite, the contemporary Native masks and sculptures. The similarities and contrasts between the work of these indigenous artists and those of the past were most fascinating. We had hoped to visit the Alaska Native Heritage Center which features traditional village settings of the Eskimo, Aleut and Indian peoples and presentations of dance, music and craft-making. Unfortunately for us, it was closed for a private party, so off we went to Wasilla, about 40 miles north, to the Iditarod Trail Headquarters. A small museum and film on the history of “the last great race on Earth”, a chance to talk with a musher, take a short dog sled ride (available May to September), and pet some puppies made it worth the trip. Soon we suppose there will be a monument to Vice Presidential candidate Sarah Palin, who certainly put Wasilla on the world map. For animal lovers there is also a Musk Ox Farm as well as a Reindeer Farm in nearby Palmer. But, for my railroad buff husband, we couldn’t leave Wasilla without a stop at the Museum of Alaska Transportation and Industry to poke around trains, planes and automobiles. There really is something for everyone! The words “Alyeska” as well as “Alaska” are derived from the Aleut word meaning “great land of white to the east.” After our very brief visit, we have to agree.